The Forensic Accounting and Auditing Department is hosting a Stakeholders Consultative Meeting to discuss the introduction of the Diploma and Postgraduate Diploma in Forensic Accounting and Auditing. The Biotechnology Department has hosted a "Potential Collaborations Workshop where some organisations and individuals presented some potential research projects and areas with the intend of establishing collaborations with the university. Three university students from Zimbabwe scooped the first prize for the most creative idea during a Hackathon at the 10th World Summit on the Information Society (WSIS) Forum in Geneva, Switzerland. A workshop to present the Institute's aligned Strategic Plan: VISION 2020 "Designing the Future" to the Institute Board was held today in the Multipurpose Hall. HIT was awarded the 2018 Tertiary Institution Award by the Zimbabwe National Chamber of Commerce Mashonaland Region Business Awards at a ceremony held on 29 March 2019 in Harare. The Indian Embassy and the Harare Institute of Technology held a media reception where it was celebrating the cordial relations between the people of India and Zimbabwe last Friday. The Harare Institute of Technology is handing over its Emergency Relief to the victims of Tropical Cyclone Idai through the Red Cross / Crescent Society, following the loss of lives as well as the destruction of property and homes in Manicaland, Masvingo and Mashonaland East provinces. The Harare Institute of Technology in conjunction with the African Regional Intellectual Property Organisation (ARIPO) is conducting a two day Intellectual Property Awareness and Training Workshop for part IV students from the various university's schools. Another Strategic Planning Workshop was held on campus where the University's several strategic units and service centres presented their action plans which in alignment to Education 5.0, Industry 4.0. and the country's VISION 2030 that aims to transform Zimbabwe into a modern industrialised and middle-income economy by 2030. The Zimbabwe Energy Regulatory Authority (ZERA) has handed over a donation of Multi-Seat Computer System worth USD 25 000 to the Institute Library and Information Services. The Food Technology Association (FTA), a student association in the Department of Food Processing Technology held a successful interface with industry on 8 March 2019. The interface brought together students and captains of the food and beverages industry for an Indaba under the theme 'Mordenisation of the Food Industry Through Quality and Legislation'. Vice Chancellor of the Harare Institute of Technology, Eng. Q.C. Kanhukamwe has won the Outstanding Public Sector Manager of the Year Award, (2018) conferred by the Public Sector Management Awards. At the same event, the University won the award for Best Research Institution (2018) at a ceremony held at the Meikles Hotel, Harare on Friday 15 March 2019. A delegation from the Zimbabwe Defence Forces' Staff College Junior Staff Course Number 71 has visited the Harare Institute of Technology today for a study visit to familiarize themselves with the operations of the University. The Department of Electronic Commerce, in collaboration with ZIMNAT and ZIMSWITCH has held one day Digital Marketing Workshop under the theme " Digitising for Business Transformation" today from 08-1300Hrs in the S1 Conference Room. The Harare Institute of Technology has held a Strategic Planning Workshop where the four Schools presented their plans which include the concepts of Education 5.0, Industry 4.0. and realignment to the country’s VISION 2030 that aims to make Zimbabwe a middle-income economy by 2030. Today, HIT staff members took part in CLEAN-UP EXERCISE that took place from 800hrs to 1000hrs on campus. The Chaplaincy recently held a memorial service for the late Felicity Wadzwanya, a student in the Polymer Technology and Engineering department who passed on late last year. Harare Institute of Technology students participated in the 12th Zimbabwe International Research Symposium (ZIRS) at the Rainbow Towers in the country’s capital held from the 13 - 15 of February 2019 under the theme “The Nexus between Research Industry: Key to Innovation and Sustainable Development Research Council of Zimbabwe. 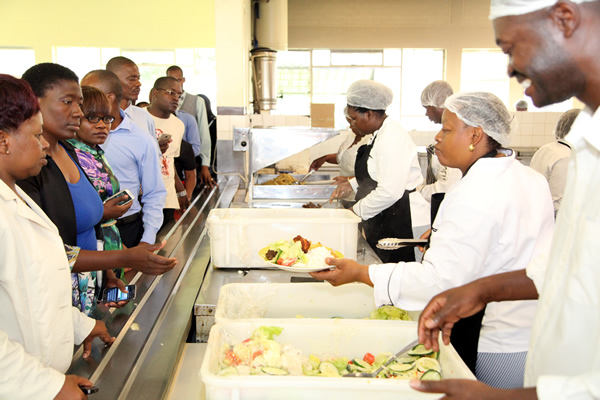 Harare Institute of Technology students have formed the Food Technology Association (FTA), a platform for interaction, sharing ideas and innovations. The Zimbabwe Library Association (ZIMLA) held its ZIMLIBRARY Open Day on 21 February 2019 in ZIMRE Park, which was officiated by HIT Senior Librarian and Chairperson of Mashonaland Branch Mr Macdonald Nhakura. The Department of Electronic Engineering, under the School of Engineering and Technology convened a stakeholders meeting to discuss the introduction of the BTech (Hons) Degree programme in Biomedical Engineering. Tinashe Chinyepe, a Pharmacy student recently visited Turkey, to participate in the Winter Student Exchange Programme held in Izmir, organised by the International Pharmaceutical Students Federation (IPSF) from 18 January to 18 February 2019. The Technology Transfer, Licencing and Commercialisation Centre (TTLC) is working with the Zimbabwe United Passengers Company (ZUPCO) to implement and commercialise its digital transport business management application “NECECITY”. The move is set to enforce productivity and efficient service delivery as the company scales up efforts to provide efficient and reliable public passenger transportation nation-wide. Eng. T. Maphosa attended the Local Authorities Chartered Accountants Workshop in Gweru, where he presented and got feedback about the Local Authorities Database System (LADS), a business solutions' softwares developed by HIT for local authorities. The Security Department organised a Student Management Workshop under the theme “Campus Activism in the 21st Century: Where is it Coming from and Where is it Going?” held at Mpumalanga Lodge in Gweru on 19 February 2019. The Harare Institute of Technology's Department of Chemical and Process Systems Engineering (CPSE) in collaboration with the Renewable Energy and Climate Change Centre (EMRECC) and the Environmental Management Agency, held the International Conference on Current Trends in Renewable Energy Technologies (ICCTR – 2019) under the theme "Sustainable Energy Technologies for All (SEFTA). The Harare Institute of Technology today entered into a Memorandum of Understanding with the National Social Security Authority (NSSA) to set the framework that facilitates collaboration and liaison between the two parties in the provision of training in occupational safety and health professional development to industrial personnel who will enroll for the Occupational Safety, Health and Environmental Management Course (OSHEMAC) training. Minister of Primary and Secondary Education Honourable Paul Mavhima has said technology will drive the nation towards middle income economy status by 2030. Zimbabwe Republic Police Deputy Commissioner General, (Crime), Cde Mutamba has said the Harare Institute of Technology is one of the most revered institutions of technology, and has underscored the importance of a multi-sectoral approach in improving systems to fight crime. Universities and research and development institutions the world over, he said, had a critical role to play in augmenting the work of the security sector. The Technology Transfer, Licensing and Commercialisation Centre has already achieved a milestone by manufacturing electricity transformers which were previously imported, a move expected to ease the supply of electricity to household and industrial users. Vice Chancellor of the Harare Institute of Technology, Eng. Q.C. Kanhukamwe has summoned the collective strength of the University, and a re-dedication and recommitment to the University’s founding ideals, saying these are important elements towards the ultimate realisation of the institutional mandate, and to the successful implementation of the national policy Imperatives-Education 5.0 and Industry 4.0. In compliance with the Presidential Clean-Up Declaration by His Excellency the President of the Republic of Zimbabwe, Cde Emmerson Mnangagwa, staff of the Harare Institute of Technology gathered on Friday 4 January 2019 to observe the exercise from 8am. All HIT Staff Members participated in a CLEAN-UP EXERCISE that took place from 1100hrs to 1230hrs on campus today. PyData Harare is partnering with Data Science Zimbabwe, Harare Institute of Technology (HIT) and Pycon Zim to hold their first MEETUP on the 8th of December 2018. The PyData MEETUP for those interested in Python, data science or machine learning. Best of all it’s a free MEETUP. Come and Join the fastest growing tech community in Zimbabwe. President of the Republic of Zimbabwe, and Chancellor of the Harare Institute of Technology, Cde Emmerson Dambudzo Mnangagwa, has charged HIT to lead Industry 4.0,- advancing Zimbabwe’s entry into the Fourth Industrial Revolution, while pledging his support to making HIT the citadel of inventions and a critical strategic institution for technological skills development. HIT, he said had established an enviable base of the requisite human intellectual capital to champion this cause. The Harare Institute of technology is hosting the Launch of the Organisation for Women in Science for the Developing World Zimbabwe Chapter and 25th Anniversary Celebration. The HIT Boost Club won UDS$3 500 at the "Delta Make A Difference National Competitions and Showcase" held on Friday 9 November 2018 at the Rainbow Towers in Harare, after a thrilling display of technopreneurship and innovation brilliance. The Biotechnology Department in hosting the International Workshop On Trends in Immunodiagnostics running from 8 - 9 November 2018 at Harare Institute of Technology's Multipurpose Hall. HIT Vice Chancellor Engineer Quinton Kanhukamwe has reiterated the University's commitment to nurture graduates responsive to industry demands, and is dedicated to helping shape an industrial renaissance. The Cyber Crime Management Conference kicked off today at the Manna Resorts in Glen Lorne, Harare. The conference will run until Friday, October 5, and is being held under the theme "Transforming the Nation in the face of Cyber Threats." Michelle Chikakano of the Polymer Technology and Engineering department won the First Prize Shield and $350 after coming first in the poster presentations at the 2018 National Engineering Students Award Competition (NESAC) Finals held at the National University of Science and Technology (NUST) on Friday 28 September 2018. At the Institute Board's 32nd session, Deputy Chairperson, Dr. Eng. Gloria Magombo bid farewell to colleagues, following her appointment as Permanent Secretary in the Ministry of Energy and Power Development. The Institute Board met for its 32nd session today. In his statement to the Board, Chairman Dr Gibson Mandishona congratulated His Excellency, President Emmerson Mnangagwa on his election, and subsequent inauguration as President of the Republic of Zimbabwe. The Department of Industrial Manufacturing Engineering and the Technology Transfer Centre (TTLC) is hosting the INNOVATION AND DISRUPTIVE TECHNOLOGIES WORKSHOP today, under the theme " ADAPTING TECHNOLOGIES TO DRIVE REAL WORLD SOLUTIONS." The Information Communications and Technology Services Department is hosting the G-SUITE FOR EDUCATION - GOOGLE CLASSROOMS WORKSHOP for the University's academic staff today in N112 Computer Laboratory. A Finance, Audit and Risk Committee meeting was held today on campus to receive, discuss and make appropriate responses regarding the Second Quarter Financial Statements and the proposed 2019 budget before adopting for presentation to the Institute Board. A Joint Meeting of the Campus Development Committee and the Finance, Risk and Audit Committee was held in the Institute Board Chambers today. Four students from the Harare Institute of technology are set to participate in the 2018 National Engineering Students Awards Competitions (NESAC) to be held on Friday 28 September 2018 at the National University of Science and Technology. Congratulations to Professor Fanuel Tagwira, Permanent Secretary for the Ministry of Higher and Tertiary Education, Science and Technology Development. Congratulations to Dr. Eng. Gloria Magombo, Permanent Secretary in the Ministry of Energy and Power Development. A Pharmacy Council of Zimbabwe (PCZ) delegation visited the campus today to conduct an inspection of the Bachelor of Pharmacy teaching facilities at Harare Institute of Technology. The Technopreneurship Development Centre, held another public lecture under the theme "Rafting the Business Terrains through Modern Leadership Competencies in a Volatile, Uncertain, Complex and Ambiguous (VUCA) World." Eng. Perkins Muredzi, Dean in the School of Industrial Sciences and Technology has been appointed Board Member of the Zimbabwe Institution of Engineers (ZIE), effective 10 September 2018 to 31 March 2021. 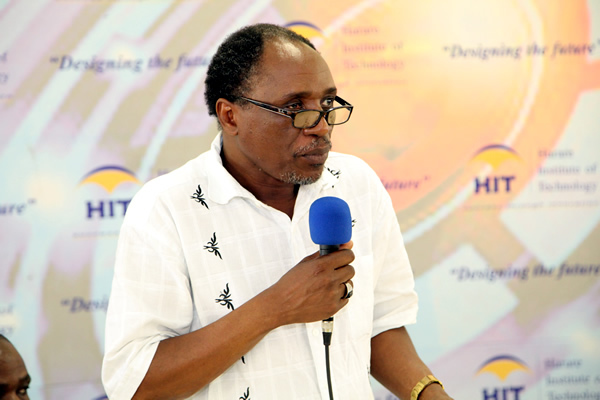 HIT has embarked on an accelerated infrastructural development programme on the construction of the Technovation Centre, New Learning Centre, a Pharmacology Laboratory and sporting facilities. The Technopreneurship Development Centre, held a public lecture under the theme "Developing an entrepreneurial mindset" on 12 September 2018. The lecture focused on unlocking self-awareness on the part of students, nurturing them to identify their personal vision and pursuing it with passion and confidence. Congratulations to Professor A. Murwira, Minister of Higher and Tertiary Education, Science and Technology Development. The Harare Institute of Technology has entered into a Memorandum of Understanding with Tshwane University of Technology of Pretoria in South Africa, effective 6 September 2018. The Technology Transfer and Licensing Centre, (TTLC), established to champion the University's commercialisation thrust, led the HIT exhibit at the just ended Harare Agricultural Show from 27 August to 1 September, 2018 at the Exhibition Grounds. HIT students who excelled in the ZIMNAT HACKATHON received their awards at the company's Headquarters on 21 August 2018. The Bindura University of Science Education (BUSE) team comprising E. Manhando, S. Manhando, C. Chadzingwa and D. Zulu scooped the overall winners of the annual Vice Chancellor's Innovation and Scholarship Fund Golf Tournament held on 10 August 2018 at the Chapman Golf Club in Harare. A Welcome Reception for Staff Development Fellows who completed their M.Tech degrees at various universities in India has was held on 8 August 2018 in the Engineering Hall. The Information Security and Assurance Department conducted its first digital forensics investigations short training course entitled "Digital Forensics Investigations Essentials." The course was held on campus from 16 – 20 July 2018. The Electronic Engineering Department held a two-day staff seminar under the theme "Driving Innovation and Strategic Technology Transfer Through Technopreneurship" from 19-20 July 2018. The Technology Transfer, Commercialisation and Licensing Centre (TTCLC) is a newly established entity responsible for the management of the Institute's Research, Development and Innovation outputs. The Centre is responsible for technology transfer in terms of commercialisation of inventions and discoveries, tech-licensing and business ventures including joint venture partnerships and venture capital. The Harare Institute of Technology has established an Innovation and Design Thinking Laboratory, (IDTL) to provide a critical space for innovation and creativity. Following the signing of a Memorandum of Understanding between the Harare Institute of Technology and the Transilvania University of Brasov of Romania on 7 June 2017, the latter invited HIT on a reciprocal visit, whose main objective was to identify the next steps to further develop cooperation between the two universities. The Harare Institute of Technology is developing into a diverse and complex University that specialises in the teaching and training of Science, Engineering, Technology, Technopreneurship, Business and Management Sciences, Professional and Collaborative programmes including technical pedagogy. Following his swearing in and inauguration as the President of the Republic of Zimbabwe on Friday, 24 November 2017 in Harare, His Excellency, President Emmerson Mnangagwa unveiled a new dispensation where he called on all citizens to work together in rebuilding the nation. He also laid out his vision for the country to move towards a new trajectory of growing the economy. Malaysian academician and researcher, Dr Norazida Mohamed has stressed the importance of leaders in setting, nurturing and sustaining organisational culture. The Harare Institute of Technology Vice Chancellor, Engineer Quinton Kanhukamwe emerged the first runner up in the Northern Region Public Sector Leadership Awards held at the Rainbow Towers Hotel on Friday 1 June. Over 35 participants attended the two intensive short training courses on Fundamentals of Nanoscience; and Nanotechnology convened by the department of Chemical and Process Systems Engineering. The two courses were held from 7 - 8 June, and 13 – 15 June 2018 respectively. A delegation from the Namibian Training Authority visited the Harare Institute of Technology on 14 June 2018, to explore possibilities for collaboration. The inaugural workshop on 'Re-positioning ICTs Services in Zimbabwean Universities as a Strategic Function for Higher Education,' was held at the Harare Institute of Technology's Innovation and Design Thinking Laboratory from 14-15 June 2018. The Lab was built with support from the United Nations Development Fund, (UNDP). Professor Prakash Sai L, of the Indian Institute of Technology, Madras delivered a seminar on "Strategic Management of Technology and Innovation" on 15 June. Mayibongwe Sibanda, a Chemical and Process Systems Engineering student won the first prize in the HIT 2018 Pre-National Engineering Students Awards Competitions (NESAC) held on June 6 at the University campus. She will proceed to represent HIT at the Nationals to be held in August this year. Michelle Chikakano of the Polymer Technology and Engineering department came first in the poster presentations with her project entitled "Value Addition to Post-Consumer Pet Bottles to Produce 100% Non-weave Polyester Fibres for the Zimbabwe Textile Industry – A case of Petrocozim P/L". The University escalated its anti –litter campaign by holding a clean-up exercise on June 8 under the theme - "Litter Free Environment-Stimulant of Innovation." The Zimbabwe Information and Communication Technology Division (ZICT) of the Zimbabwe Institution of Engineers has endorsed HIT as having some of the best brains when it comes to Block Chain Technology that is used to develop cryptocurrency, urging the Reserve Bank of Zimbabwe to consult with information technology experts from the University. The department of Chemical Processes and Systems Engineering (CPSE) and Information Security and Assurance, working in collaboration with the Technology Centre, are launching new short course training programmes. Final examinations for the Second Semester of the 2017/18 academic year began in earnest on Monday 21 May, with students expressing confidence and hope in succeeding. The exams will end on Monday 4 June. HIT part two and final year students from across all the departments presented their HIT 200 and 400 Capestone Design projects two weeks before sitting for their second semester examinations. A ZIMCHE delegation, led by Dr Hilton Chikuya, Principal Director for Academic and Institutions Audits visited the University on 14 May to inspect the teaching and learning facilities, as well as to verify the physical preparedness of the Institute to launch the new M.Tech degree programmes. From 24-27 September 2018, the Department of Chemical and Process Systems Engineering (CPSE), in collaboration with the Environmental Management, Renewable Energy and Climate Change Centre (EMRECC) will host the International Conference on Current Trends in Renewable Energy Technologies (ICCTR – 2018) under the theme "Sustaining Energy Technologies for All (SEFTA). Chairperson and lecturer of the Department of Software Engineering, Ms Prudence Kadebu is set to attend a five-week TechWomen mentorship and exchange program in the San Francisco Bay Area, Silicon Valley and Washington DC, in the United States from 23 September to 29 October 2018. The Federal Republic of Germany Ambassador to the Republic of Zimbabwe, His Excellency Dr Thorsten Hutter visited the Harare Institute of Technology on a fact finding mission and to discuss possible collaborations between the University and German tertiary, engineering and technology institutions and organisations. The Harare Institute of Technology has signed a Memorandum of Understanding with Elevate Trust concerning cooperation in engineering and technology research. Dr S.J Awin Sayiram, the SRM University (Chennai, India) Chief of Strategy and Operations paid a courtesy visit to HIT on 11 May 2018. The Harare Institute of Technology Vice Chancellor Eng. Q.C Kanhukamwe was conferred with the African Leadership Engineering Excellence Award at the Third African Educational Institutions of Excellence Showcase (AEIS) held in Washington DC, USA on 20 April, 2018. The Harare Institute of Technology's Department of Information Security and Assurance co-hosted the National Cybersecurity Conference held in Harare from 10 – 11 April 2018, under the theme "Cybersecurity- a shared responsibility". The School of Information Sciences and Technology hosted the Innovation in Information and Communication Technologies (ICT) Workshop under the theme 'Igniting Success Through Innovation' on 20 April 2018. The School of Business and Management Sciences Department of Forensic Accounting and Auditing held a Public Lecture on Corruption in collaboration with the Embassy of Romania to the Republic of Zimbabwe and the Zimbabwe Anti-Corruption Commission (ZAAC). A delegation of over 40 senior military officers from the Zimbabwe Staff College Joint Command Staff course Number 31 visited the University on 17 April 2018. The Human Resources and Administration department organised a two-day Examinations Processing Training Workshop from 4 -5 April 2018. The Harare Institute of Technology participated at the just-ended Zimbabwe International Trade Fair (ZITF) which took place from 24 to 28 April 2018 at the ZITF Grounds in Bulawayo. A Women Entrepreneurship Development Training (WEDT) programme was conducted by Homelink Finance Services in partnership with the Harare Institute of Technology's Technopreneurship Development Centre (TDC) in Gwanda from 19-23 March 2018 in Gwanda under the theme 'Entrepeneurship Mindset For Sustainable Businesses'. The Harare Institute of Technology Vice Chancellor Eng. Q.C Kanhukamwe was awarded the Vice Chancellor of the year runners-up prize at the MegaFest 2017 National Business Awards with Africa University Vice Chancellor Professor Munashe Furusa scooping the ultimate prize. Tendai Gukuta, a third year HIT student studying for a Bachelor of Technology Honours Degree in Biotechnology has been appointed the Southern Africa Network for Biosciences (SANBiO) Student Ambassador for Zimbabwe. UNDP Country Director Mr Georges van Montfort and HIT Vice Chancellor Eng. Q.C Kanhukamwe and Pro-Vice Chancellor Dr M. Chanakira inspecting progress on the installation of ICT equipment at the HIT Innovation and Design Thinking Laboratory. HIT Staff Development Fellow in India, Mr Godfrey Tigere won the Best Paper Award at the SRM University Second International Conference on Advanced Mechanical Engineering (ICAME) 2018, held from 22-24 March 2018 in Chennai, India. Minister of Higher and Tertiary Education, Science and Technology Development, Professor Amon Murwira has called on educational institutions to focus on heritage based innovation in solving the country's problems. Speaking at the Great Dyke Career Fair held at Gresham grounds in Zvishavane on 23 March 2018, Prof. Murwira said education should play a transformative role in uplifting and empowering the people. As part of its outreach efforts, the Communications and International Relations department attended a Career Fair organised by ASA Resource Group, (Freda Rebecca Gold Mine and Trojan Mine). The event was held on Wednesday 21 March, and was attended by over 20 exhibitors from the higher and tertiary education sector, as well as industry and commerce. In positioning itself to Government's initiative to support the establishment of Innovation Hubs, the Harare Institute of Technology has initiated the first phase of the implementation of one of its key performance areas derived from the Strategic Plan Vision 2020, which is to set up a Hi-Tech Development Valley. The Harare Institute of Technology in collaboration with Parirenyatwa Group of Hospitals is introducing new health sciences programmes at the undergraduate and post graduate level beginning August 2018. HIT Computer Science Lecturer and Staff Development Fellow, Mr. Chrispen Mafirabadza was awarded a Gold and Silver Medal at the ITM University Convocation Ceremony held on Friday 18 November 2017 at ITM University Gwalior, in India. A delegation from the Zimbabwe National Defence University academic and administration departments visited the Harare Institute of Technology to familiarize with the Institute's administration and academic operations. University frontline staff attended a half day refresher course this month, coordinated by the Human Resources department. The workshop covered topics such as Customer Service, Effective Communication, Grooming and Etiquette, Teambuilding, among others. The first edition of the Women in Technology Event (WITECH 2018) was successfully held at HIT on 8 March 2018 under the theme "Women in Technology: Working towards Progress for All", as part of the commemorations to mark the International Women's Day. A workshop for Zimbabwe Universities' Information Communications Technologies Services' Directors was held at the Harare institute of Technology to look into issues of customer needs and strategise on programmes which leverage on internal skills and partnerships. The HIT Boost Enactus team was awarded second prize at the 2018 Boost Enactus Fellowship Leadership Conference held from 25-27 January at Batanai Gardens in Harare. The Harare Institute of Technology recently held a Security Supervisor training symposium from 24 to 26 January 2018, at the University campus. The Harare Institute of Technology participated in the Zimbabwe Newspapers Group Inaugural Career's Expo on Friday 26 January at the Harare International Conference Centre. On behalf of the Institute Board and indeed on my own behalf, I would like to wish you all a Happy New Year,- hoping that you had a restive and festive holiday season, and that you come back refreshed and invigorated to take 2018 head on. A team of Zimbabwean nanotechnology researchers led by Mr Tatenda Madzokere, a lecturer from the Department of Chemical and Process Systems Engineering attended and presented cutting-edge research papers at the 9th International Conference of the African Materials Research Society (AMRS) 2017 in Gaborone, Botswana from 11-14 December 2017. Twelve students from the Electronics Engineering department participated in a competition on the design and implementation of Uninterrupted Power Supply (UPS) devices for TelOne ASDL and GPON modems, with the winners walking away with a USD 2000 prize. The department of Pharmaceutical Technology participated at a two-day Biochemistry and Molecular Biology International Symposium held from 14-15 November 2017 at the Holiday Inn Hotel in Harare, under the theme "Applications of Biochemistry in Everyday Life." The inaugural Professionals Skills Competition to rate pharmacy students' aptitudinal skills was held at the Harare Institute of Technology, under the auspices of the Zimbabwe Pharmaceutical Students Association (ZPSA) on 13 November 2017. Students and staff from the School of Information Sciences and Technology toured the High Performance Computing Centre (ZHPC) at the University of Zimbabwe on 3 November 2017 to explore the facility and assess its efficacy in the development of complex algorithms; as well as to seek access to the facility in preparation for their Capstone Design Projects. Minister of Higher and Tertiary Education, Science and Technology Development, Professor Amon Murwira has said HIT is an embodiment of STEM; pledging to support the work of the University in STEM programmes,- by fully supporting the establishment of a Technopark. Congratulations to His Excellency, President of the Republic of Zimbabwe. Cde E.D Mnangagwa. Congratulations to Dr D. Sibanda, Permanent Secretary for the Ministry of Higher and Tertiary Education, Science and Technology Development. The Harare Institute of Technology recently received a commendation from His Excellency the President of the Republic of Zimbabwe and Chancellor of the Harare Institute of Technology, Cde R.G. Mugabe on its technological thrust which has seen the University producing tangible products vital for the country's development. The International Conference on Industrial Automation (IConIA) organised by the Industrial and Manufacturing Engineering department from 25-26 October, highlighted the importance of industrial automation in national development. President of the Republic of Zimbabwe and Chancellor of the Harare Institute of Technology, His Excellency Cde R.G. Mugabe capped 418 HIT graduates at the Institute's 8th Graduation Ceremony on Friday 6 October 2017. In his address at the Institute's Eighth graduation Ceremony held on campus on 6 October 2017, Vice Chancellor Eng. Q.C Kanhukamwe told the gathering that HIT is making inroads towards its goals of conducting research which is responsive to national needs, challenges and aspirations. 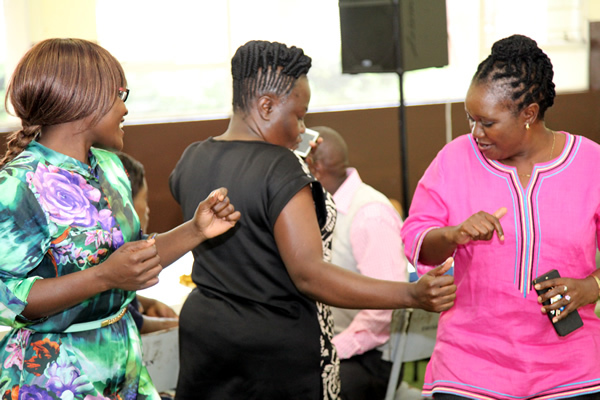 The Harare Institute of Technology, in partnership with Homelink, (a subsidiary of the Reserve Bank of Zimbabwe) successfully hosted the first edition of the Women Entrepreneurship Development Training programme. The programme was held from 25-29 September, at the Institute campus in Belvedere, under the theme: "Entrepreneurship Mindset for Sustainable Businesses". The Harare Institute of Technology Vice Chancellor, Eng. Q.C. Kanhukamwe, Senior Management, Staff and Students congratulate the recently appointed Institute Board led by veteran Researcher and Scientist, Dr Gibson Mandishona. The HIT Vice Chancellor, Eng. Q.C. Kanhukamwe has appointed an Industrialisation and Modernisation Taskforce to implement the Ministry of Higher and Tertiary Education, Science and Technology Development transformation - further deepening its Science, Engineering and Technology orientation. The Taskforce, will among others, oversee the incorporation of culture and heritage studies, as well as medicine programmes at HIT. In his annual address to first year students held on 8 September 2017, HIT Vice Chancellor Eng. Q.C Kanhukamwe urged freshmen to conform to the new dispensation in higher education; which now requires students to use their education to come up with solutions to real-life challenges. The Harare Institute of Technology has entered into a Memorandum of Understanding with telecommunications company, Tel One. Lecturer in the Technopreneurship Education Centre, Mr Jani retired from the service of HIT on 31 July 2017. Christine Juta scooped the second prize at the National Engineering Students Awards Competition (NESAC) 2017 Edition held at the Cresta Lodge in Harare on 4 August. The 2017 Student Representative Council (SRC) elections were held on Wednesday 30 August 2017 and a new committee was voted into Office for the period 2017/18. An Industrial Biotechnology Training Workshop organised by the Non-Aligned Movement Centre for Science and Technology (NAM S&T), Ministry of Higher and Tertiary Education, Science and Technology Development, Zimbabwe and the National Biotechnology Authority of Zimbabwe (NBA) was held in Harare from 22 - 24 August running under the theme "Driving Value-Addition and Beneficiation". The 2017 Edition of the Zimbabwe International Book Fair was held from 31 July – 5 August 2017 in Harare under the theme: "Making the Book Pay." The HIT Enactus team won the Digital Knowledge Award worth $750 at the ENACTUS National Competition held on Friday 14 July at the Celebration Centre, in Harare. HIT Vice Chancellor, Eng. Q.C. Kanhukamwe has been appointed as an Alternate member of the Association of African Universities Governing Board; representing Southern Africa. The Harare Institute of Technology scooped several medals at the sixth edition of the Chancellor's Games held at the Bindura University of Science Education, (BUSE) in July. The Harare Institute of Technology's School of Business and Management Sciences, in collaboration with the Handong Global University of South Korea successfully hosted the second edition of the Southern Africa Global Entrepreneurship Programme at the Zimbabwe School of Mines in Bulawayo. The Harare Institute of Technology has entered into a Memorandum of Understanding with the Commercial Bank of Zimbabwe, (CBZ); effective 27 June 2017. Three HIT students in the School of Information Science and Technology recently visited the Huawei Technologies Headquarters in Beijing, China for a two week internship placement under the Zimbabwe "Seeds for the Future" 2017 programme from 12 -23 June 2017. Kudzai Chasinda, a 3rd year Software Engineering student has been shortlisted on the Facebook Messenger Bots Challenge Finalists. The 60 finalists were selected from over 1000 entries from across 64 countries in Sub Saharan Africa and the Middle East. Egypt took the roost with the most number of finalists. Addressing the Institute's stakeholders and participants at the Third Edition of the Vice Chancellor's Innovation and Scholarship Fund Golf Tournament at Chapman Golf Club on 19 May, the HIT Vice Chancellor, Eng. Q.C Kanhukamwe took the opportunity to highlight the new paradigm shift in the higher education terrain. The Ministry of Information Communication Technology, Postal and Courier Services has endorsed the HIT brand and has requested for engagement with the Harare Institute of Technology in the promotion of ICT research projects. The Harare Institute of Technology will host the third edition of the Technovation Expo on Friday 28 July 2017 at the HIT campus in Belvedere, from 9am to 4pm. This year's edition is running under the theme "Designing the Future." The second edition of the Global Entrepreneurship Training (GET) 2017, Southern Africa is set for Bulawayo from 10-18 July 2017 at the Zimbabwe School of Mines under the theme Opportunistic Entrepreneurship for Sustainable Industrialisation". The Harare Institute of Technology has entered into a Memorandum of Agreement for education and scientific co-operation with Transilvania University of Brasov, Romania effective from 7 June 2017. Christine Juta, a final year Electronic Engineering student won the first prize in the HIT 2017 Pre-National Engineering Students Awards Competitions (NESAC) oral presentations while Kudakwashe Pasurayi from the Industrial and Manufacturing Engineering department also came first in the poster presentations. Deputy Minister of Higher and Tertiary Education, Science and Technology Development, Hon. Dr Godfrey Gandawa has urged universities to lead the modernisation and industrialisation agenda pronounced by the Ministry, in partnership with industry. The Harare Institute of Technology and the Embassy of India in Zimbabwe, jointly hosted commemorations to mark the International Day of Yoga at the University campus in Belvedere. Universities around the world are increasingly becoming engines of economic growth shifting from their traditional primary role as education providers and scientific knowledge creators to a more complex "technopreneurial" university model that incorporates the additional role of commercialization of knowledge and active contribution to the development of public and private enterprises in the local, regional and global economy. The Zimbabwe Newspapers Group team comprising Mr D. Kamwendo, Mr I Madyambudzi, Mr Kaviya and Mr M Haatendi emerged the overall winners of the annual Vice Chancellor's Innovation and Scholarship Fund Golf Tournament held on 19 May at the Chapman Golf Club in Harare. Harare Institute of Technology Vice Chancellor, Eng. Q.C Kanhukamwe has been appointed to a Higher and Tertiary Education, Science and Technology Development Taskforce to drive industrialisation and mordenisation of the society through the Science, Engineering, Technology and Mathematics (STEM) Initiative. The 2017 Edition of the Vice Chancellor's Innovation and Scholarship Fund Golf Tournament is set to for the Chapman Golf Club on 19 May 2017 in Harare. Huawei Technologies has offered three internship placements to HIT students in the School of Information Science and Technology at its headquarters in Beijing, China under the Zimbabwe Seeds for the Future 2017 programme. The Technology Centre will conduct a Reverse Flow Borehole Hand-drilling Training Workshop in collaboration with a United States based engineering organisation running from 15th -26th May 2017. A delegation from the Zimbabwe Defence College Joint Command and Staff Course Number 30 visited the Harare Institute of Technology on Wednesday 5 April for a study visit to familiarize themselves with the operations of the Institute. The Harare Institute of Technology was recently awarded the "EDUCATION AND TRAINING ENTERPRISE INNOVATION AWARD" at the Business Leadership and Enterprise Competitiveness Summit held in the capital on 30 March 2017. The Ministry of Higher and Tertiary Education, Science and Technology Development, Harare Institute of Technology and Verify Engineering Private Limited have entered into a Memorandum of Agreement effective 23 March 2017. Twelve papers were presented by HIT academics at the 11th Zimbabwe International Research Symposium held at the Harare International Conference Centre from 16 to 17 February. The symposium was held under the theme "Research for Unlocking Entrepreneurship: Bridging the Gap." The Chairperson in the department of Pharmaceutical Technology, Professor Mazuru Gundidza; together with Lab. Technician Mazuru Pomerai and Pharmacy student, Kudzai Muchandibaya attended the Second International Conference on Pesticidal Plants which was held at the Elephant Hills Resort in Victoria Falls from 6-9 February. The Dean of Students Division is at the centre of coordinating all student programmes and activities; with an approach based on empowerment and leadership development. The division facilitates the holistic development of students and the realisation of their full potential, within a conducive learning environment. A Basic Communication and Counselling Skills workshop was held by the Registry's Department (Human Resources) from 23 – 27 January 2017 on Campus to train staff on basic communication and counseling skills at work. His Excellency the President of the Republic of Zimbabwe and Chancellor of the Harare Institute of Technology, Cde R.G. Mugabe has approved the appointment of Dr Maxwell Chanakira as the Pro Vice Chancellor of the Harare Institute of Technology. The appointment is effective 1 January 2017. On behalf of the Institute Board, and the Senior Management, I would like to take this opportunity to wish you all a Happy New Year. The Registrar of the Harare Institute of Technology, Mrs Mary Samupindi has clinched second position in Zimbabwe's Top 20 Outstanding Women of the Year Awards by Megafest. The Harare Institute of Technology has entered into a Memorandum of Understanding on the exchange of faculty, scholars, students, academic information and materials with Gachon University of South Korea, effective from 12 December 2016. The Harare Institute of Technology was recently awarded the "COMMUNITY DEVELOPMENT AWARD" at the inaugural Harare Metropolitan Province Business Forum's Social Responsibility Excellence Awards held in the capital in recognition of organisations and individuals that have contributed to the socio-economic development of the Province. Over 20 staff development fellows from HIT recently left Zimbabwe to pursue doctoral studies at various universities in India. The staff development exercise is part of HIT's strategy to strengthen its human intellectual base as it gears towards the introduction of postgraduate programmes in the not so distant future. The Technology Centre has commissioned a 14 tonne Gear Hobber for the production and processing of spur gears or cylindrical straight gears, synchronous pulleys, spline gear shafts, helical gears, worm gears and sprocket wheels in batch or single production for use in the mining, petroleum, plastics, steel, food processing, agricultural, automotive industries and power plants. Clive Nyapokoto's Vermi-Acquaponics project which won the Energy Global Award in South Africa and also scooped the first prize at the Zimbabwe ICT Innovation Fund showcase organised by the Postal and Telecommunications Regulatory Authority of Zimbabwe (POTRAZ) is now at the commercialisation stage. The Institute's Students' Health Club, under the auspices of the Students Affairs Division recently held a Health and Wellness Expo from 13 to 14 October under the theme: "Delivering Health to the People, Bringing Life to Everyone Around Us". His Excellency, the President of the Republic of Zimbabwe and Chancellor of the Harare Institute of Technology, Cde R.G. Mugabe conferred Bachelor of Technology Honours degrees to 347 graduands at the University's Seventh Graduation Ceremony held on Thursday 20 October. The Harare Institute of Technology hosted a 5 day Mentorship programme on Technology Transfer under the theme, Strengthening Research and Innovation Management (SRIM). The Harare Institute of Technology and Vice Chancellor Eng. Q.C Kanhukamwe continue to gain international acclamation as the Vice Chancellor was recently awarded the International Socrates Award for "THE MANAGER OF THE YEAR" in the education sphere while the Institute was awarded "THE BEST ENTERPRISE AWARD." The Zimbabwe SANBio Student Ambassadorial team, led by Joyce Fati Masvaya recently visited the Malawi Fish Node at Lilongwe University of Agriculture & Natural Resources (LUANAR) to familiarise with ongoing projects that could also be undertaken by youth in Zimbabwe; as an initiative to involve the youth in food security and food production. More than $10,000 was raised at the second edition of the Vice Chancellor's Innovation and Scholarship Fund Golf Tournament which was held at the Chapman Golf Club on 23 September in Harare. The Harare Institute of Technology Vice Chancellor Eng. Q.C Kanhukamwe has been honoured with the "Award for Leadership Excellence in Technology Innovation" while the University was also recognised with the "Award for Institutional Building." Government, through the Ministry of Higher and Tertiary Education, Science and Technology Development has urged young academics to take the lead in Zimbabwe's technological revolution through strategic alliances and futuristic initiatives; as the country heads towards industrialisation. The Harare Institute of Technology (HIT) together with Steward Bank has launched student identity cards with banking functionalities as part of the bank's efforts to enhance financial inclusion. All is set for the hosting of the second edition of the Technovation Day on Friday 22nd July 2016 from 0930hours to 1600hours at the HIT Campus in Belvedere, Harare. The Harare Institute of Technology has been accredited as a professional and student chapter of the Association of Computing Machinery (ACM) to become the third chapter in Sub Saharan Africa. Clive Nyapokoto, a final year Software Engineering Student is this year's winner of the Energy Globe National Award after his Vermicompost - Vermi-Aquaponics (VA) System project was honoured by Advantage Austria the official Trade Promotion Organisation (TPO) which recognises success in green technologies and organisers of the Energy Globe Awards. The Harare Institute of Technology has entered into a Memorandum of Agreement with the University of the District of Columbia (UDC) Centre for Entrepreneurship, Leadership and International Development (CELID), effective from 16 May 2016. Kudzai Aggrey Chasinda a second year HIT student of the Software Engineering Department was in San Francisco, United States of America attending the Google I/O 2016 Conference hosted at the Shoreline Amphitheatre. All is set for the End of Second Semester Examinations 2016 -2017 Academic Year scheduled from Monday 23 May to 8 June 2016. The Airforce of Zimbabwe is seeking collaboration with the Harare Institute of Technology in the areas of aircraft engineering and technology development. The Technology Centre, a strategic unit of the Harare Institute of Technology has strengthened its focus and operational activities on technology research and development, production and training, in line with the Institute's mandate, which is to develop, incubate, transfer and commercialise technology. Joyce Fati Masvaya, a third year student at the Harare Institute of Technology, studying for a Bachelor of Technology Honours Degree in Biotechnology has been crowned the SANBio Student Ambassador for Zimbabwe, at a colourful ceremony held at the HIT Campus on Thursday 21 April. The Harare Institute of Technology has been applauded as a shining national beacon in the pursuance of excellence in science and technology for sustainable economic development driven by young people. The Harare Institute of Technology has entered into a Memorandum of Understanding with Turgit Özal University of Ankara in Turkey, effective from 28 March 2016. The Zimbabwe Pharmaceutical Students' Association, (ZPSA) will jointly host the 62nd International Pharmacy Students Federation (IPSF) World Congress in Zimbabwe at the University of Zimbabwe and the Harare Institute of Technology. HIT student leaders recently attended a training programme on Basic Communication and Systemic Peer Counseling held at the Monomutapa Crowne Plaza Hotel from 29 March to 2 April 2016. The military has endorsed the Harare Institute of Technology as an institution that plays a pivotal role in national development. The Harare Institute of Technology students stole the limelight at the recently held e-Tech Africa Conference 2016, where they showcased their e-tech applications and solutions; receiving special endorsement from the Minister of Information Communication Technology, Postal and Courier Services Honourable Supa Mandiwanzira. It was all joy and celebrations for women at Loti and Rukovo business centres in Mutoko district as they received and witnessed the first installation of Solar Driers from the Harare Institute of Technology's Technology Centre for their horticultural projects. Harare Institute of Technology students emerged champions at the inaugural World Bank Water and Sanitation Services Hackathon after coming up with the best viable business solution in the form of a user-friendly application that can be used by residents to interface with City Councils for solving water and sanitation problems. The World Bank Zimbabwe Office hosted its first Water and Sanitation Hackathon to address challenges in water and sanitation services (WSS) delivery in the country at the Harare Institute of Technology. The Hackathon brought together practitioners, community members, and programmers in a 48-hour marathon to develop technical solutions that could improve water and sanitation services for Zimbabwe's consumers. The Second Semester of the 2015/16 academic year commenced in earnest on Monday, 22 February 2016. It was a hive of activity at the University campus as students went about the formalities of completing registration and settling into their various halls of residence. From December 2015 to date, the Institute has entered into various Memoranda of Understanding with like-minded institutions both locally and abroad. In line with its policy of internationalization, these Memoranda of Understanding will broaden the scope and sphere of influence of the HIT. The Harare Institute of Technology was priviledged to host the first ever Global Entrepreneurship Summit from 25 to 30 January 2016. The Summit was hosted in partnership with the Handong Global University with support from the Korean Government and the United Nations Educational Scientific and Cultural Organisation, (UNESCO). Government has commended the Harare Institute of Technology for playing a transformative role in society by embracing opportunities that are availed by the United Nations' UNESCO-UNITWIN programme to address issues of poverty eradication, empowerment and the dignity of people. On behalf of the Institute Board, and indeed on my own behalf, I would like to wish you all a Happy New Year and the encompassing spirit of hope and vitality, which each New Year brings. The Harare Institute of Technology was honoured with the 'International Award For Excellence in Sustainability Innovation' for its research, which delivers tangibles in the form of Patents, Utility Models, and Copyrights that are sustainable and industrially applicable. The Director of the Environmental Management and Climate Change Research Centre, Dr Anthony Phiri has been appointed to the capacity building negotiations as part of the ongoing deliberations on how to build the capacity for African nations and other parts of the developing world in dealing with Climate Change. Professor Gundidza, Chairperson of the Harare Institute of Technology's Department of Pharmaceutical Technology was among the panel of presenters on scientific research at the International Conference on AIDS and STIs in Africa (ICASA) held in Harare from 29 November to 4 December2015. The 2015 Vice Chancellor\'s Luncheon was held on 17 December 2015. On a speech read on his behalf, the Vice Chancellor expressed his heartfelt appreciation to all staff members for working tirelessly throughout out the year to make HIT the most preferred university brand, especially when the Institute celebrated its 10th Anniversary. Microsoft Corporation has been amazed by innovations that are being churned out by the Harare Institute of Technology. The School of Business and Management Sciences has recently launched a programme in Forensic Accounting and Auditing. The new programme is in line with national interest and agenda of pursuing an Anti-Corruption thrust. Tatenda Madzokere, a lecturer in the department of Chemical and Process Systems Engineering at the Harare Institute of Technology has been awarded a first class degree in the M.Tech in Nanotechnology from the SRM University in Chennai, Tamilnadu, India. The HIT community celebrated Open Access Week from 19 to 23 October, under the theme: "Open for Collaboration". The week –long celebrations were led by the HIT Library and were held as part of the 10th Anniversary celebrations. The Harare Institute of Technology has entered into a Memorandum of Understanding with AVM Africa (Pvt) Ltd. The MoU was entered into on 1 October 2015 at the Harare Institute of Technology campus. Harare Institute of Technology's Vice Chancellor, Engineer Quinton Kanhukamwe has urged the Institute's first year students to take their studies seriously as they are the tools to develop Zimbabwe into a first world country. His Excellency the President of the Republic of Zimbabwe and HIT Chancellor, Cde Robert Gabriel Mugabe capped 320 graduates at the University's Sixth Graduation Ceremony that coincided with the institution's 10th Anniversary Celebrations. Harare Institute of Technology's graduand, Auxilliah Chiwanga from the Department of Chemical and Process Systems Engineering has won the First Prize at the 2015 National Engineering Students Competition Awards held at the Harare Institute of Technology. Minister of Higher and Tertiary Education, Science and Technology Development, Honourable Jonathan Moyo has called for more investment in science education in Zimbabwe. The African Regional Intellectual Property Organisation (ARIPO) is calling on African governments to embrace Intellectual Property to enhance national development. The Harare Institute of Technology participated in 'Future's,' a Careers, Education and Awareness Event held at St George's College in Harare. Representatives from the Schools of Engineering and Technology and Information and Communication Technology, with the Communications and International Relations Department attended the exhibition. The Environmental Management, Renewable Energy and Climate Change Research Centre (EMRECC) recently held a consultative workshop on the establishment of a four-year Bachelor of Technology Honours degree in Envirotechnology and Waste Management Engineering at the Harare Institute of Technology. Professor Eric Masinde Aseka, Vice Chancellor of the International Leadership University, Kenya, recently held a talk on "Transformational Leadership and Technology in the 21st Century," on 25 September 2015 at the request of the Dean in the the School of Business and Management Sciences, Mr W. Gwarimbo. Over 30 participants and staff members from the Zimbabwe National Defence College Course 4 of 2015 visited the Harare Institute of Technology to familiarize with the Institute's mandate and activities and its contribution in enhancing national security. The Institute's Students' Health Club, under the auspices of the Dean of Students department recently held a Cervical Cancer Screening and Cancer Awareness day on Friday 25 September. The Harare Institute of Technology marked its 10th Anniversary celebrations on Thursday 27 August at the Institute campus in Belvedere. Government officials, foreign envoys, captains of industry and commerce, representatives from fellow universities and tertiary institutions and the students and staff of the Harare Institute of Technology attended the event. Harare Institute of Technology's 10th Anniversary Celebrations were marked by several public workshops from 24 to 26 August 2015. The workshops were centred on various technologies and were hosted by the Schools of Engineering and Technology, Industrial Sciences and Technology and Information Science and Technology Business and Management Sciences. Minister of Higher and Tertiary Education, Science and Technology Development Honourable Professor Jonathan Moyo made his inaugural visit to the Harare Institute of Technology on 25 August where he met senior management and toured the Institute' campus. Steward Bank Zimbabwe, an innovative financial services provider is set to partner the Harare Institute of Technology in graduate training programmes, sponsoring an innovation and entrepreneurial academy through competitions and providing scholarships for students at internationally acclaimed universities. Dean Muredzi Scoops the "Education Leadership Award"
Mr Perkins Muredzi, the Institute's Dean in the School of Industrial Sciences & Technology was awarded the "Education Leadership" global award by the Chartered Institute of Management Accountants (CIMA) at the World Education Congress that took place in Mumbai, India. The Harare Institute of Technology once again scooped the best exhibitor's trophy, ahead of Zimbabwe's 14 state and private universities at the Research and Intellectual Outputs, Science, Engineering and Technology, (RIO-SET) Expo held from 3-5 September 2015 at the National University of Science and Technology in Bulawayo. Harare Institute of Technology's 10th Anniversary Celebrations continued with several public workshops from the 24th through to the 26th of August 2015 on various technologies by the Schools of Information Science and Technology, Industrial Science and Technology, Business & Management Sciences and Engineering & Technology. Two HIT staffers Darlington Katsande and Sungai Mazando won silver medals at the recently held Chancellor of State Universities Staff Games. HIT Vice Chancellor Eng Q.C Kanhukamwe has commended the collaborative effort by the Zimbabwe Farmers Union (ZFU) and United Nations Development Programme (UNDP) on working on the latest approaches to improving productivity by young farmers. Vice Chancellor of HIT, Engineer Quinton Kanhukamwe inspired young entrepreneurs at the Innovation Baraza held on 10 July at the Baraza Pavilion in Tynwald, Harare. The event was coordinated by the Public Affairs Section of the United States Embassy in Harare. A joint international conference between the Harare Institute of Technology and the Planet Scientific Research Centre (PSRC) was held on 15 July 2015 at the Harare International Conference Centre (HICC) under the theme – Collaborative Research For Socio -Economic Development. As part of the 10th Anniversary celebrations commemorative activities, the Human Resources Department took the lead in co-ordinating the Employee Welfare and Wellness days from 6 to 7 July on campus. A workshop on Diplomacy and Etiquette was held for the HIT Senior Management on 21 July on campus. The workshop was facilitated by the Ministry of Foreign Affairs. HIT successfully hosted the inaugural Technovation Day on Friday 19 June 2015 at the Institute campus. The Technovation Day was held to showcase research and development outputs, products and services to a wide ranging audience including University academics, high school pupils and practitioners in the field. The School of Business Management Sciences has launched a new professional diploma and career-enhancing programme in Microfinance. The programme gives an in-depth understanding of best practices, current technological developments, managerial acumenship and strategic techniques that effectively drive economic growth through competent microfinance enterprise development. InstiChem, a chemical engineering business unit of the Harare Institute of Technology's Department of Chemical and Process Systems Engineering has launched a range of chemical products that include detergents such as toilet cleaner, dish wash and car wash. The Harare Institute of Technology recently exhibited at the Africa Big Seven, (AB7) Tradeshow in Midrand, South Africa from 21-23 June. The event was coordinated by ZIMTRADE. The Librarian Mr J. L Maenzanise and Mr M. Nhakura, a Senior Library Assistant recently attended the Third African Library and Information Associations and Institutions (AfLIA) conference held at the Ghana Institute of Management and Public Administration (GIMPA) Conference Centre, University of Ghana, Accra from the 30 May to 2 of June 2015. The Vice Chancellor, Engineer Q.C. Kanhukamwe joins the entire HIT community in mourning the passing on of Margareth Chiumbe, (39), a staff member in the Library and Information Services Department who succumbed to cancer on Friday 26 June 2015 at Parirenyatwa Hospital. Women engineers call for support to other women and young girls pursuing careers in engineering. The second edition of the Women in Engineering Open Day Workshop was held at the Harare Institute of Technology on June 11, 2015 running under the theme: Inspiring and Building Women's Engineering Capacity For National Empowerment. Local Biotechnology experts have called for more awareness, the promotion of biotechnology research and a review of the government policy on genetically modified organisms in order to provide solutions in food security and sustainable energy provision. The Harare Institute of Technology Senior Management team convened a meeting to apprise the Board of progress in the Implementation of the Strategic Plan Vision 2020. The meeting was held on campus and was attended by the Institute Board and the Senior Management team. Tinashe Gongera, a final year Electronics Engineering student won the first prize in the HIT 2015 Pre-National Engineering Students Awards Competitions (NESAC) held on campus on 22 May. The inaugural Vice Chancellor's Innovation and Scholarship Fund Golf Tournament was successfully held at the Borrowdale Brooke Golf and Country Club in Harare on 29 May. Participants were drawn from the Institute's stakeholders, Board and senior management. The tournament format was the Four Ball-Better Ball Alliance. HIT Vice Chancellor Eng. Q.C Kanhukamwe has called for the nation to invest more funds and resources towards research and development activities so as to provide technological solutions and create employment. The Food Processing Technology, (FPT) Department successfully hosted a workshop on Innovations in Food Technology on 24 April on campus. The Zimbabwe Institution of Engineers has awarded the K. D. Stevens Award to Engineer Mercy Manyuchi, Chairperson for the Chemical and Process Systems Engineering Department. The Harare Institute of Technology participated in the just ended Zimbabwe International Trade Fair which took place from 28 April to 2 May. The premier international exhibition was held under the theme: "Stimulating Trade, Seizing Opportunities to Accelerate Growth." The HIT Rotaract Club has donated food items, maize, clothing and coffee mugs to the Mutemwa Leprosy Centre in Mutoko. The visit was part of HIT Rotaract Club's community service outreach programmes. Harare Institute of Technology Board Chairman Dr Gibson Mandishona has challenged HIT senior management to rise to the occasion and steer the HIT ship towards long term sustainability and growth. The Harare Institute of Technology Institutional Repository was officially launched on Friday 27 March on campus. Speaking at the launch, the HIT Librarian, Mr Jasper Lee Maenzanise highlighted that the Institutional Repository was an integral aspect of the research processes at HIT and would aid in the advancement and creation of new knowledge, aligned to the institutional mandate. Microsoft has established a base at HIT through its Virtual Academy which is running a series of courses which began with the cloud-computing platform (Azure), to promote skills development and access to affordable technologies in local contextualized innovations. Capital market experts have challenged HIT students to develop technologies that advance and promote rapid capital market development in Zimbabwe. The Health Expo, held from 25-27 March kick started the HIT 10th Anniversary celebrations. Held under the theme: "Celebrating 10th Anniversary through a healthy lifestyle," the Health Expo was hosted by the HIT Health Club under the Student Affairs Division. The military has hailed the Harare Institute of Technology for enhancing national security through innovations in various technologies. HIT academic, Dr Anthony Phiri has been appointed to the Curriculum Innovation Working Group of the Southern African Regional Universities Association (SARUA). Ten techies from the Harare Institute of Technology have completed a three-month business incubation process aimed at transforming their technical prototypes into commercially and socially viable ventures. The Vice Chancellor of the Harare Institute of Technology, Engineer Quinton Kanhukamwe has called on all HIT technicians to embrace unity of purpose in the discharge of their duties at the Institute and to give greater impetus to the realization of the HIT mandate. According to the Departmental Governance Ordinance 17: 2005, the Vice Chancellor, Eng. Q.C Kanhukamwe appointed the following Departmental Chairpersons. The Harare Institute of Technology has entered into a Memorandum of Understanding with Amity University, Gurgaon, India effective from 15 January 2015. The MoU will run for five years. The Harare Institute of Technology will host its 10th Anniversary celebrations this year, (2015); commemorating the establishment of the Institute in 2005 by the Government of Zimbabwe through the HIT Act, Chapter [25:26]. The Harare Institute of Technology Vice Chancellor, Engineer Quinton Kanhukamwe has urged the Institute staff to uphold unity of purpose and collective action in the discharge of the HIT mandate. 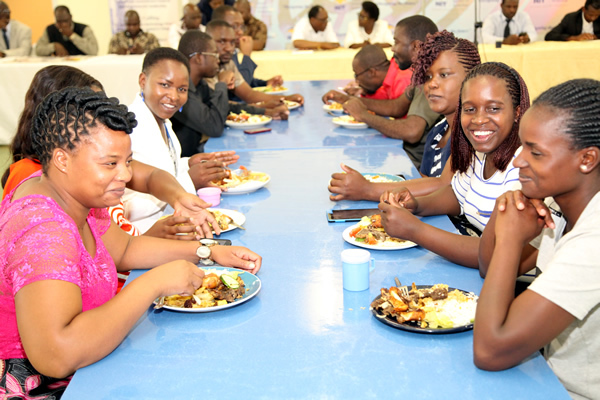 Engineer Kanhukamwe was speaking at the End of Year Luncheon held on Thursday 11 December at the Institute campus. As the year came to a close, the Harare Institute of Technology was once again recognised for its sterling work and contributions in the higher education sector. Two Harare Institute of Technology staff members, Mr Dinga Njini Moyo and Mr Charles Kanyunga recently put the institution on the national map, when they won awards at commemorations to mark World Standards Day held at the Rainbow Towers Hotel in Harare on 14 October. The Harare Institute of Technology has entered into a Memorandum of Understanding with the Chungnam National University based in Daejon, South Korea. The agreement was entered into on 13 November 2014. Harare Institute of Technology Vice Chancellor, Engineer Quinton Kanhukamwe has pledged his commitment to lead the Harare Institute of Technology and propel it to greater heights in the quest to live and achieve the Institutional mandate as articulated by Government. President Mugabe capped 277 graduates at the fifth graduation ceremony of the Harare Institute of Technology that coincided with the installation of Engineer Quinton Kanhukamwe as the first Vice Chancellor. Harare Institute of Technology's graduate, Tatenda Nengiwa from the Department of Chemical and Process Systems Engineering has won the First Prize at the National Engineering Students Competition Awards held at the University of Zimbabwe. The Harare Institute of Technology Vice Chancellor, Engineer Quinton Kanhukamwe has challenged the Institute's first year students to embrace the HIT brand and unleash their potential so that they become the technocrats that will bring the envisioned first world Zimbabwe into reality. Corporate Vice President of Microsoft Corporation and President for Africa and the Middle East, Ali Faramawy has paid tribute to the innovative and creative power of the youth, who represent the future of global technological transformation, and in particular, HIT students. The Harare Institute of Technology has the largest faculty of Information Sciences in sub-saharan Africa, according to disciplines. The Harare Institute of Technology recently hosted the Corporate Vice President of Microsoft Corporation and President for Africa and the Middle East, Ali Faramawy at a Public Lecture on campus. The Public Lecture was held under the topic – "The Microsoft Strategy" and was attended by the HIT community. The Harare Institute of Technology won the first prize as the Best Exhibitor 2014 amongst all local universities at the recently held Research and Intellectual Expo-Science, Engineering and Technology (RIE –SET WEEK 2014) Exhibition held at the University of Zimbabwe Grounds from the 3rd – 6th September 2014. His Excellency and Chancellor, the President of the Republic of Zimbabwe, Cde R. G Mugabe, has appointed Eng. Quinton Kanhukamwe as the inaugural Vice Chancellor of the Harare Institute of Technology with effect from 1 July 2014. Two engineering projects by final year students from the Department of Chemical Processes and Systems Engineering have made it into the Zimbabwe Institute of Engineers National Final Year Engineering Students Awards to be held in early September 2014. The Harare Institute of Technology has successfully filed its first patent for the Preparation of Adansonia digitata flavoured Soy milk based yorghut, with the African Regional Intellectual Property Organisation (ARIPO). Two Harare Institute of Technology student leaders recently went on a study tour of the USA institutions of higher learning funded by the US Department of State's Bureau of Educational and Cultural Affairs. The Harare Institute of Technology's School of Business and Management Sciences in collaboration with the British Council successfully held a Public Lecture addressed by Professor Peter Ndege from Moi University of Kenya. The Harare Institute of Technology has been applauded for playing a critical role in national security by focusing on technology development, transfer and commercialisation thus fostering a culture of innovation and technopreneurship that creates a solid national defence system against technological threats from outside. In recognition of its growing reputation as a hands-on and practical oriented degree awarding institution, the Harare Institute of Technology has received yet another Award for Excellence for the year 2013 at a Megafest National Business Awards ceremony held at Rainbow Towers in Harare. The award is an acknowledgement of the commendable research work being done by the University that will benefit the Zimbabwean industry and society. Following the recent enrolment of HIT staff development fellows at the VIT University of Vellore, the Indian institution has upped the tempo and is seeking to strengthen partnership and collaboration with HIT. The 2014 Edition of the Boost Fellowship Entrepreneurs Suite Challenge was recently launched at the Harare Institute of Technology amid calls to provide young people with opportunities for mentoring, team creation, education and networking through various activities aimed at equipping them with the skills to generate business ideas, writing business plans and eventually start their own businesses. The Institute Board recently held a two day Corporate Governance Workshop at Pandari Lodges in Harare. The workshop, which was facilitated by Zimbabwe Leadership Forum's leading advocate of corporate governance Mr Canaan Dube and Tsitsi Mutasa was also attended by HIT senior management staff. Vhaina Mazvita Mukamba, the President of the ENACTUS HIT raised the flag of the Institute high after being awarded the BOOST Fellow of the year 2013 at the recently held BOOST Fellows Graduation Ceremony. The Harare Institute of Technology Board Chairman, Dr Gibson Mandishona has challenged fellow board members and the senior management team to deliver to national expectation. He posed the challenge during the 16TH Institute Board meeting on the 28th January 2014, which coincidentally was the first meeting for this year. The Deputy Minister of Energy and Power Development, Honourable Munacho Mutezo has officially handed over the Public Solar Water Heating Pilot Project to the Harare Institute of Technology. In its broader policy of internationalisation, HIT staff members have joined the Association of Computing Machinery (ACM) and Institute of Electrical and Electronic Engineers (IEEE). These associations provide some of the benchmarks HIT uses in developing curriculum which have earned HIT international recognition and awards. The Harare Institute of Technology through its Acting Vice Chancellor, Engineer Quinton Kanhukamwe was on 18 December 2013 admitted into the Oxford Club of Rectors (CRE), a prestigious grouping of university presidents and vice chancellors based in the UK. The HIT brand continues to grow as the Institute and its Vice Chancellor received international acclaim and accolades as the 2013 came to a close. HIT Acting Vice Chancellor Eng. Q. kanhukamwe was amongst several dignitaries in the business and academic sector honoured with a career and leadership award from the Laying Solid Foundation Institute, (Lasof) at a dinner held in Harare in recognition for their sterling work towards positive contribution in building positive legacies in society. Visiting Iranian delegation from the Centre of Innovation and Technology Co-operation (CITC) has agreed to partner the Harare Institute of Technology (HIT) in setting up facilities to produce life-prolonging drugs. This deal could help the country save millions of dollars on drug imports and offer hope to HIV-positive people in the face of critical shortages of anti-retrovirals. President Mugabe capped 182 graduates from the Harare Institute of Technology with the institution saying Zanu-PF's victory in the harmonised elections would foster national development. ONE-HUNDRED and eighty-two students graduated at the Harare Institute of Technology (HIT) yesterday amid calls by the institution to be allocated more land for expansion. 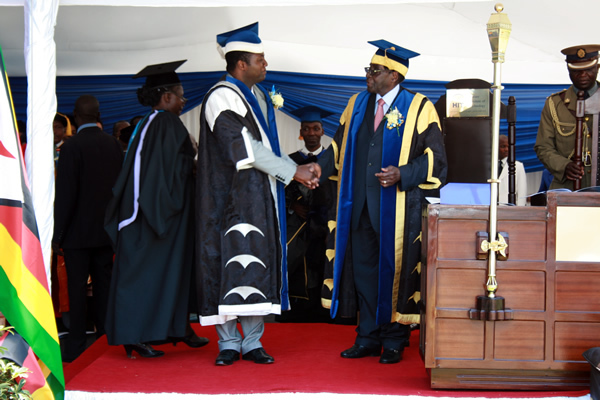 Graduands were capped by President Robert Mugabe, who is chancellor for all State universities in Zimbabwe. A delegation from the Zimbabwe Higher Education Council (ZIMCHE) led by the its chief executive Officer, Professor Emmanuel Ngara recently visited HIT for an annual assessment of quality and standards exercise. Over 50 students from the Electronic Commerce Department were awarded with certificates after successful completing World Intellectual Property Organization's Distance Learning Courses which will enable them to apply intellectual property knowledge in the ever-growing global electronic commerce business in Zimbabwe and the Southern African region. A Leadership and Corporate Governance Seminar was recently held by the Technopreneurship Development Centre in collaboration with the HIT BOOST ENACTUS Team in preparation for the Ethics and Transparency competition for all national universities to be held before the end of this year. The Harare Institute of Technology has established yet another international partnership programme with the VIT University of Vellore in India establishing academic linkages and contacts through a formalized MoU between the two universities. The Harare Institute of Technology has once again won an international award for business excellence and high quality performance as well as best customer satisfaction. The award, given in Rome on June 24, was bestowed on HIT by the Association Otherways Management and Consulting based in Paris, France. A Zambian Parliamentary Portfolio Committee on Education, science and technology recently paid a courtesy call at the Harare Institute of Technology on a fact-finding mission. Dean Muredzi publishes a book on Emerging Non Thermal Food Processing Technologies for college students. This book by Dean Muredzi is most vital in availing information on new techniques in food processing that is sought after by students studying in various food science and technology programmes in institutions of higher learning and can also be used as reference literature for industrialists and scholars. The Harare Institute of Technology's School of Business and Management Sciences in collaboration with the British Council and the African Centre For Real and Land Economics (ACRELE) hosted a Research Writing Seminar under the theme - Advancing Cutting Edge Research For World Class Professionals. In view of the Harare Institute of Technology's destiny, which is to be the stimulant of scholarship in innovation, the HIT Department of Industrial and Manufacturing Engineering officially launched the Women in Engineering Open Day on Thursday 20th June 2013. The new Iranian Ambassador to Zimbabwe, His Excellency, Mr Mohamad Aminejad has pledged to strengthen cooperation between the Centre for Innovation and Technology Cooperation (CITC), Tehran, and the Harare Institute of Technology. THE Chief Secretary to the President and Cabinet visited the Harare Institute of Technology and launched the Government's Graduate Entrepreneurial and Employment Promotion Programme (GEEPP) to provide jobs and create equal economic opportunities using local resources and institutions. The Acting Vice Chancellor has once again challenged the Technology Centre staff to come out of their cocoons and assume national responsibilities by ramping up production activities within the centre to create wealth and employment. In a show of confidence in the Harare Institute of Technology brand, international universities and organisations have signed cooperation agreements with the Institute. The Institute`s senior management and Chairpersons of all Academic Departments recently converged in Nyanga for a three day workshop at Troutbeck Inn Resort to review the Strategic Plan: Vision 2015 – Designing the Future. The Harare Institute of Technology continues to gain international acclamation as its Acting Vice Chancellor Engineer Quinton Kanhukamwe was recently awarded the International Socrates Award "THE NAME IN SCIENCE AWARD" in the Science sphere for personal contribution to intellectual development of today's society by the Europe Business Assembly. The Harare Institute of Technology (HIT) Board Chairman Dr G. Mandishona, the entire Institute Board, Management, Staff and Students congratulate Acting Vice Chancellor Engineer Quinton Kanhukamwe on being conferred the Zimbabwe Institute of Management Manager of the Year Awards Public Services. Energy and Power Development Minister, Mr Elton Mangoma has commissioned a Solar Water Heating System at the Harare Institute of Technology, the first of its kind in Zimbabwe. In commemoration of the Tree Planting Week, the HIT Vice Chancellor Eng. Q.C Kanhukamwe planted a Red Mahogany tree on Campus. The Harare Institute has recently won international recognition for outstanding leadership and contribution to education, science and technology. The Acting Vice Chancellor Eng. Quinton Kanhukamwe revealed this during his address to HIT staff at the 2012 End of Year Vice Chancellor's Luncheon. President Robert Mugabe conferred 164 graduates with degrees at the Harare Institute of Technology's Third graduation ceremony. The Indian Ambassador to Zimbabwe, Mr. Jeitendra Tripathi has reaffirmed his country's support for Harare Institute of Technology's commitment to deepen co-operation in areas of technology transfer and staff exchange with Indian institutions. The inaugural Chancellor of Zimbabwe State Universities Staff Games kicked off at the National University of Science and Technology from 27 to 31 August 2012 under the theme - Promoting Unity and Diversity through Sports. The games were officially opened by Minister of Higher and Tertiary Education. The South African Minister of Higher Education and Training, Dr Bonginkosi Emmanuel "Blade" Nzimande recently paid a courtesy visit to the Harare Institute of Technology whilst he was on an official visit to Zimbabwe. The Harare Institute of Technology has entered into a sponsored research agreement with the Rural Electrification Agency (REA) to collaborate and jointly fund research into the development, manufacturing and testing of high voltage transformers and related components. The Centre for Innovation & Technology Cooperation of the Presidency of Islamic Republic of Iran (CITC) has entered into an agreement of technology transfer and collaborative research with the Harare Institute of Technology. The Harare Institute of Technology is in discussions with the People's Republic of China Hunan Province's College of Science and Technology to discuss the establishment of Leather and Plastic Technology centres at HIT campus. The primary areas of focus are the training components of the leather and plastics centres. The Institute`s senior management and heads of various departments recently convened for branding workshop which was addressed by the Acting Vice Chancellor Engineer Q.C Kanhukamwe . The Harare Institute of Technology has signed yet another milestone agreement of collaboration with the Institute of Technology Sepuluh, Nopember (Indonesia) with the objective of facilitating mutual friendship, academic research and educational cooperation between the two institutions. In line with its strategic plan – Vision 2015, the Harare Institute of Technology has upgraded its telecommunications hardware and network system by installing a state of the art TDE600 IP-BX telephone system. The HIT Electronic Engineering Department Robotics Club, recently held a four day workshop on using LEGO Mindstorms Education for Robotics for primary and secondary school teachers. The Harare Institute of Technology has signed yet another milestone Memorandum of Understanding with the Jawarharlal Nehru Technological University Hyderabad, India. The Harare Institute of Technology is now a fully subscribed member of Research Africa through its Library and Information Services Department. The Harare Institute of Technology Financial Engineering students recently visited the Zimbabwe Stock Exchange for an orientation on the local bourse.